CakePHP comes with comprehensive testing support built-in. CakePHP comes with integration for PHPUnit. In addition to the features offered by PHPUnit, CakePHP offers some additional features to make testing easier. This section will cover installing PHPUnit, and getting started with Unit Testing, and how you can use the extensions that CakePHP offers. CakePHP uses PHPUnit as its underlying test framework. PHPUnit is the de-facto standard for unit testing in PHP. It offers a deep and powerful set of features for making sure your code does what you think it does. php composer.phar require --dev phpunit/phpunit:"3.7.38"
This will install either PHPUnit 4.x or 5.x, depending on your system setup and your composer.json configuration. PHPUnit 4 is not compatible with CakePHP’s Unit Testing. In CakePHP 2.5.7 and later you can place the phar directly in your vendors or App/Vendor directory. All output is swallowed when using PHPUnit 3.6+. Add the --debug modifier if using the CLI or add &debug=1 to the URL if using the web runner to display output. It’s a good idea to make the test database and your actual database different databases. This will prevent any embarrassing mistakes later. After installing PHPUnit and setting up your $test database configuration you can make sure you’re ready to write and run your own tests by running one of the core tests. There are two built-in runners for testing, we’ll start off by using the web runner. The tests can then be accessed by browsing to http://localhost/your_app/test.php. You should see a list of the core test cases. Click on the ‘AllConfigure’ test. You should see a green bar with some additional information about the tests run, and number passed. Congratulations, you are now ready to start writing tests! PHP files containing tests should be in your app/Test/Case/[Type] directories. The filenames of these files should end in Test.php instead of just .php. The classes containing tests should extend CakeTestCase, ControllerTestCase or PHPUnit_Framework_TestCase. Like other class names, the test case class names should match the filename. RouterTest.php should contain class RouterTest extends CakeTestCase. The name of any method containing a test (i.e. containing an assertion) should begin with test, as in testPublished(). You can also use the @test annotation to mark methods as test methods. For example, would run the tests for your Post model. Calling the parent method is important in test cases, as CakeTestCase::setUp() does a number of things like backing up the values in Configure and, storing the paths in App. The above test is a simple one but shows the potential benefit of using test cases. We use assertContains() to ensure that our helper is returning a string that contains the content we expect. If the result did not contain the expected content the test would fail, and we would know that our code is incorrect. By using test cases you can easily describe the relationship between a set of known inputs and their expected output. This helps you be more confident of the code you’re writing as you can easily check that the code you wrote fulfills the expectations and assertions your tests make. Additionally because tests are code, they are easy to re-run whenever you make a change. This helps prevent the creation of new bugs. Once you have PHPUnit installed and some test cases written, you’ll want to run the test cases very frequently. It’s a good idea to run tests before committing any changes to help ensure you haven’t broken anything. CakePHP provides a web interface for running tests, so you can execute your tests through a browser if you’re more comfortable in that environment. You can access the web runner by going to http://localhost/your_app/test.php. The exact location of test.php will change depending on your setup. But the file is at the same level as index.php. Once you’ve loaded up the test runner, you can navigate App, Core and Plugin test suites. Clicking an individual test case will run that test and display the results. If you have Xdebug installed, you can view code coverage results. Code coverage is useful for telling you what parts of your code your tests do not reach. Coverage is useful for determining where you should add tests in the future, and gives you one measurement to track your testing progress with. 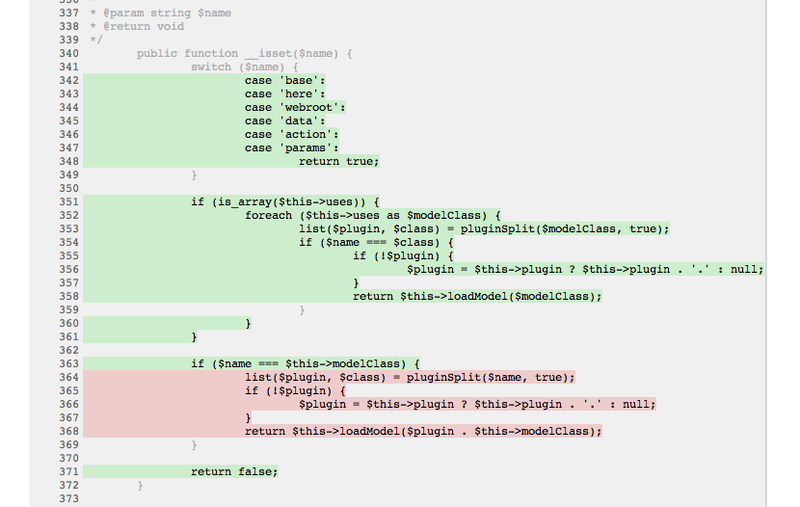 The inline code coverage uses green lines to indicate lines that have been run. If you hover over a green line a tooltip will indicate which tests covered the line. Lines in red did not run, and have not been exercised by your tests. Grey lines are considered unexecutable code by Xdebug. If you are running tests that interact with the session it’s generally a good idea to use the --stderr option. This will fix issues with tests failing because of headers_sent warnings. Changed in version 2.1: The test shell was added in 2.1. The 2.0 testsuite shell is still available but the new syntax is preferred. The filter parameter is used as a case-sensitive regular expression for filtering which test methods to run. This will put the coverage results in your application’s webroot directory. You should be able to view the results by going to http://localhost/your_app/coverage. When running tests on the command line that use sessions you’ll need to include the --stderr flag. Failing to do so will cause sessions to not work. PHPUnit outputs test progress to stdout by default, this causes PHP to assume that headers have been sent which prevents sessions from starting. By switching PHPUnit to output on stderr, this issue is avoided. tearDown is called after every test method. Should be used to cleanup after the test is complete. Always remember to call parent::tearDown(). setupBeforeClass is called once before test methods in a case are started. This method must be static. tearDownAfterClass is called once after test methods in a case are started. This method must be static. When testing code that depends on models and the database, one can use fixtures as a way to generate temporary data tables loaded with sample data that can be used by the test. The benefit of using fixtures is that your test has no chance of disrupting live application data. In addition, you can begin testing your code prior to actually developing live content for an application. CakePHP uses the connection named $test in your app/Config/database.php configuration file. If this connection is not usable, an exception will be raised and you will not be able to use database fixtures. Creates tables for each of the fixtures needed. Populates tables with data, if data is provided in fixture. Removes fixture tables from database. The $useDbConfig property defines the datasource of which the fixture will use. If your application uses multiple datasources, you should make the fixtures match the model’s datasources but prefixed with test_. For example if your model uses the mydb datasource, your fixture should use the test_mydb datasource. If the test_mydb connection doesn’t exist, your models will use the default test datasource. Fixture datasources must be prefixed with test to reduce the possibility of accidentally truncating all your application’s data when running tests. tinyinteger: maps to TINYINT or SMALLINT depending on the database platform. boolean: maps to BOOLEAN (or TINYINT(1) on MySQL). Set to primary to make the field AUTO_INCREMENT, and a PRIMARY KEY for the table. Set to the specific length the field should take. Set to either true (to allow NULLs) or false (to disallow NULLs). Default value the field takes. We can define a set of records that will be populated after the fixture table is created. The format is fairly straight forward, $records is an array of records. Each item in $records should be a single row. Inside each row, should be an associative array of the columns and values for the row. Just keep in mind that each record in the $records array must have a key for every field specified in the $fields array. If a field for a particular record needs to have a null value, just specify the value of that key as null. When overriding init() just remember to always call parent::init(). Please note that fixtures in 2.x do not handle foreign key constraints. Your application may have already working models with real data associated to them, and you might decide to test your application with that data. It would be then a duplicate effort to have to define the table definition and/or records on your fixtures. Fortunately, there’s a way for you to define that table definition and/or records for a particular fixture come from an existing model or an existing table. Using the core prefix will load fixtures from CakePHP, and using a plugin name as the prefix, will load the fixture from the named plugin. In the above example, both fixtures would be loaded from App/Test/Fixture/blog/. Changed in version 2.5: As of 2.5.0 you can load fixtures in subdirectories. We now want to set up a test that will use this model definition, but through fixtures, to test some functionality in the model. CakePHP test suite loads a very minimum set of files (to keep tests isolated), so we have to start by loading our model - in this case the Article model which we already defined. In our test cases’ variable $fixtures we define the set of fixtures that we’ll use. You should remember to include all the fixtures that will have queries run against them. You can override the test model database by specifying the $useDbConfig property. Ensure that the relevant fixture uses the same value so that the table is created in the correct database. You can see we have added a method called testPublished(). We start by creating an instance of our Article model, and then run our published() method. In $expected we set what we expect should be the proper result (that we know since we have defined which records are initially populated to the article table.) We test that the result equals our expectation by using the assertEquals method. See the Running Tests section for more information on how to run your test case. When setting up your Model for testing be sure to use ClassRegistry::init('YourModelName'); as it knows to use your test database connection. New in version 2.3: CakeTestCase::getMockForModel() was added in 2.3. While you can test controller classes in a similar fashion to Helpers, Models, and Components, CakePHP offers a specialized ControllerTestCase class. Using this class as the base class for your controller test cases allows you to use testAction() for simpler test cases. ControllerTestCase allows you to easily mock out components and models, as well as potentially difficult to test methods like redirect(). This example shows a few of the ways you can use testAction to test your controllers. The first parameter of testAction should always be the URL you want to test. CakePHP will create a request and dispatch the controller and action. In this case // more code will not be executed as the method will return once the redirect is reached. The data key will be used as query string parameters when simulating a GET request. vars Get the set view variables. view Get the rendered view, without a layout. contents Get the rendered view including the layout. result Get the return value of the controller action. Useful for testing requestAction methods. The above would create a mocked PostsController, stubbing out the isAuthorized method. The attached Post model will have save() stubbed, and the attached components would have their respective methods stubbed. You can choose to stub an entire class by not passing methods to it, like Session in the example above. Generated controllers are automatically used as the testing controller to test. To enable automatic generation, set the autoMock variable on the test case to true. If autoMock is false, your original controller will be used in the test. The response object in the generated controller is always replaced with a mock that does not send headers. After using generate() or testAction() you can access the controller object at $this->controller. This example shows a slightly more complex use of the testAction() and generate() methods. First, we generate a testing controller and mock the SessionComponent. Now that the SessionComponent is mocked, we have the ability to run testing methods on it. Assuming PostsController::add() redirects us to index, sends an email and sets a flash message, the test will pass. A second test was added to do basic sanity testing when fetching the add form. We check to see if the layout was loaded by checking the entire rendered contents, and checks the view for a form tag. As you can see, your freedom to test controllers and easily mock its classes is greatly expanded with these changes. By using staticExpects you will be able to mock and manipulate static methods on components and models. If you are using PHPUnit 4 or 5, staticExpects() does not exist anymore. Instead, you should insert the necessary data into the session with CakeSession::write('Auth.User', $user) before calling the action. Generally most applications will not directly test their HTML code. Doing so is often results in fragile, difficult to maintain test suites that are prone to breaking. When writing functional tests using ControllerTestCase you can inspect the rendered view content by setting the return option to ‘view’. While it is possible to test view content using ControllerTestCase, more robust and maintainable integration/view testing can be accomplished using tools like Selenium webdriver. Since a decent amount of logic resides in Helper classes, it’s important to make sure those classes are covered by test cases. First we create an example helper to test. The CurrencyRendererHelper will help us display currencies in our views and for simplicity only has one method usd(). Here we set the decimal places to 2, decimal separator to dot, thousands separator to comma, and prefix the formatted number with ‘USD’ string. Here, we call usd() with different parameters and tell the test suite to check if the returned values are equal to what is expected. Save this in and execute the test. You should see a green bar and messaging indicating 1 pass and 4 assertions. Tests for plugins are created in their own directory inside the plugins folder. If you want to use plugin fixtures in the app tests you can reference them using plugin.pluginName.fixtureName syntax in the $fixtures array. Jenkins is a continuous integration server, that can help you automate the running of your test cases. This helps ensure that all your tests stay passing and your application is always ready. Integrating a CakePHP application with Jenkins is fairly straightforward. The following assumes you’ve already installed Jenkins on *nix system, and are able to administer it. You also know how to create jobs, and run builds. If you are unsure of any of these, refer to the Jenkins documentation . Start off by creating a job for your application, and connect your repository so that jenkins can access your code. If you use clover coverage, or the junit results, make sure to configure those in Jenkins as well. Failing to configure those steps will mean you won’t see the results. You should be able to run a build now. Check the console output and make any necessary changes to get a passing build.